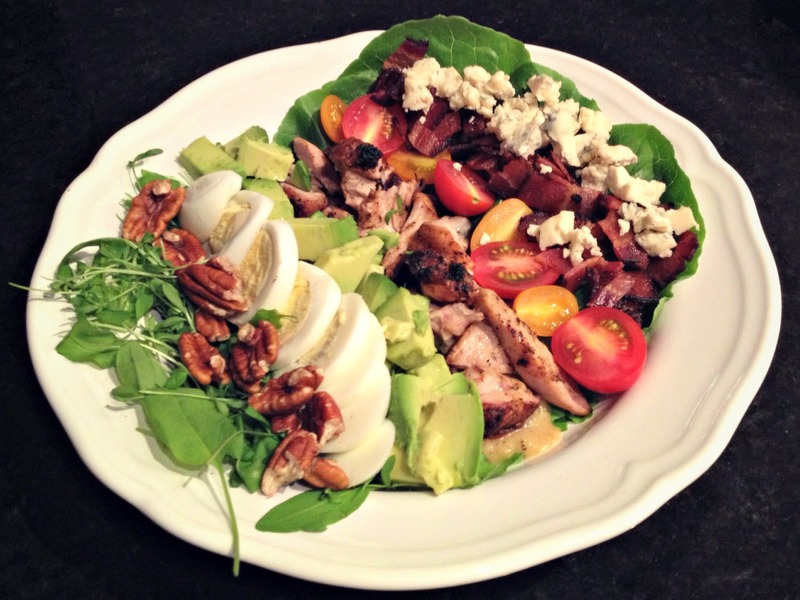 Have you ever met someone who just doesn’t like a cobb salad? Sure, there are vegetarians or vegans and ingredient-restricted individuals who steer clear of this delicious, often-reinterpreted salad, but there’s something for everyone in the well-rounded salad that eats like a meal. This version, with a southern sweet onion twist, is sure to please even the pickiest of palates. While it has many individual elements, it all comes together quickly and taking the time to make your own dressing is entirely worth it. So let’s get started. MAKE THE DRESSING: As we are likely enjoying the last week of warm sun and beautiful blue skies, we opted to grill the chicken and onions. We even wrapped the garlic in foil and threw it on the grill too. If you choose to do this step of the process in the oven, roast at 425°. Wrap the bulb of garlic (or individual cloves) in foil and set on a baking sheet. Brush the onions with oil and arrange on the baking sheet. Bake for about 1 hour, until the onions and garlic are lightly charred and soft. Let cool. Peel the garlic and transfer the cloves to a processor. Add the onions, cider vinegar and lemon juice and puree until smooth. With the blender on, gradually add the 1/2 cup of olive oil until incorporated. Season the dressing with salt and pepper. At this point, we’d like to be perfectly transparent and admit that while our recipe calls for absolute measurements, we prefer to free-pour the vinegar and oil and trust our instincts. Food is all about what tastes good right? So if you want to add a little more vinegar, knock yourself out! This dressing should have a good kick to it as it will cut through the rich chicken, bacon, and avocado and balance the salad. Remember: Taste. Taste. Taste. Taste as you go. 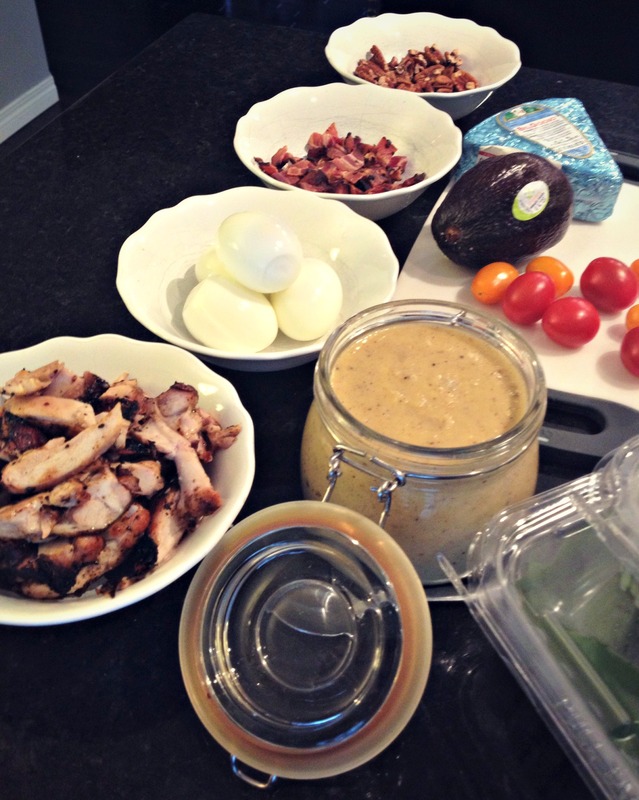 MAKE THE SALAD: In an effort to not overdress the salad (who wants wilty, wet salad? 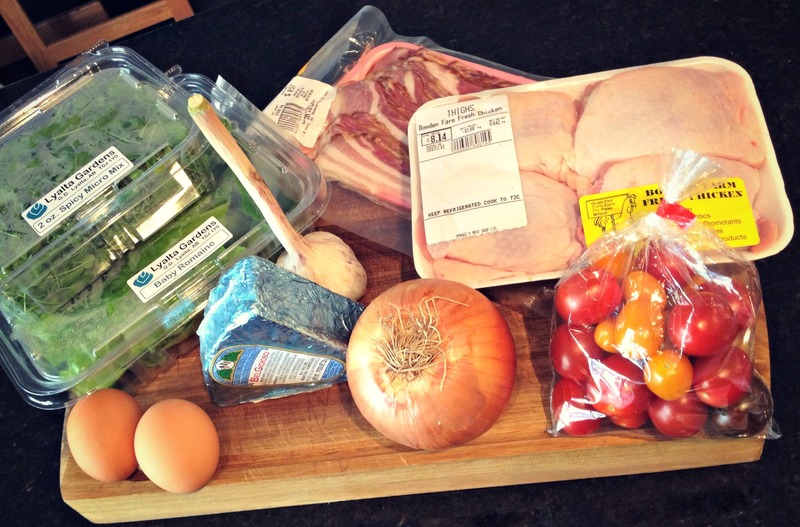 ), we placed the romaine and micorgreens in the bowl and arranged the remaining ingredients on top. Just before serving, add your fresh-made sweet onion dressing and allow your guests to toss it all together to really see the magic happen. This salad is a full meal that is sure to leave your family satisfied, hitting every mark: crisp lettuce leaves, succulent chicken, salty bacon, creamy avocado, bright tomatoes, nut-crunch…. and that’s just a few! If you don’t like blue cheese, a milder cheese will absolutely work in this salad. Choose what you like…. because let’s face it, food is meant to be enjoyed so use what you love and leave with a full and happy tummy. 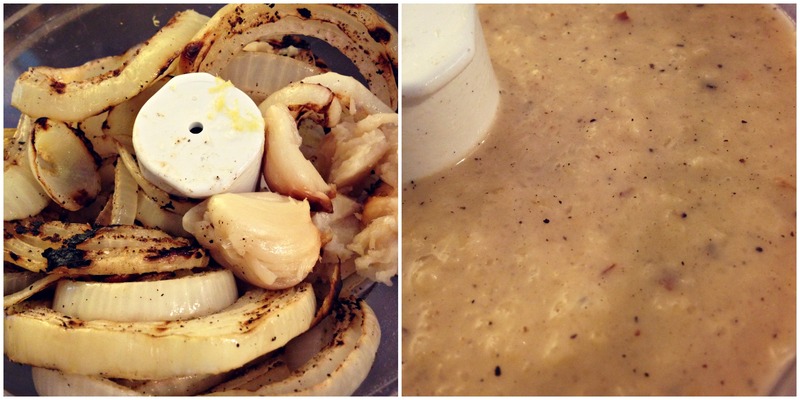 *The onion dressing can be refrigerated for up to 4 days.